A short post this week, as I don’t have much new to report. But isn’t it wonderful and completely satisfying by how fast some projects come together? Sunday night, needing a change from the socks and sockhead hat I’m working on, I grabbed yarn from my stash, cast on and in a few short hours finished a fingerless glove. Is there anything better than the fast yet fabulous projects? The pattern is one I improvised, based on the Fourth Doctor’s scarf. I Think I Found My Mojo! 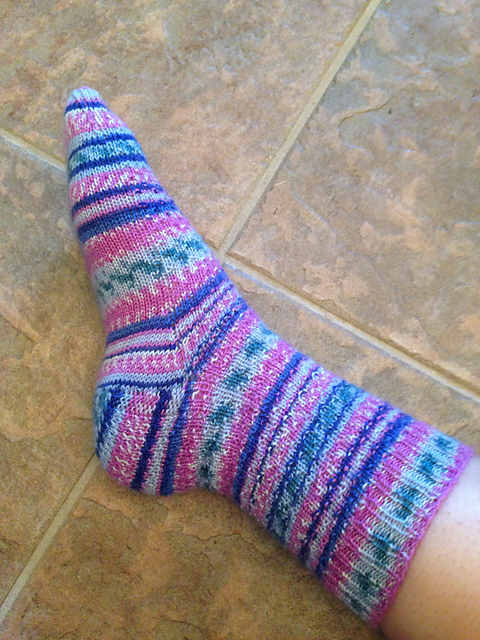 Last week, when I posted, I was tapped for inspiration and barely knitting. I’m not sure which invisible switch was flipped, but my needles have been hard at work this week! 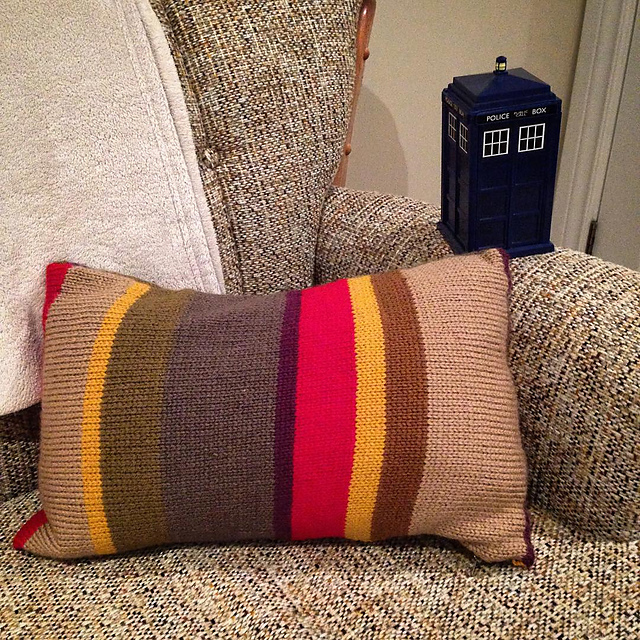 I finished my first accent pillow, and the Whovian in me is simply delighted! Knit with the colours of the Fourth Doctor’s iconic scarf, I finished seaming the pillow and adding the zipper on Monday. I like making these knit pillow cases with zippers, so that if they need washing, it doesn’t become a huge production. I can unzip, wash, then rezip. Easy peasy. Every house needs a touch of Doctor Who, doesn’t it? After completing this pillow, I grabbed a yarn that had been in my stash for a few years and started making a cowl. I lost the ball band, but a friend helped me identify this yarn as Sirdar Donegal Tweed. I’ve loved it since I first bought it. It reminds me of crushed Smarties (for any Americans reading this, the Canadian Smarties are like M&Ms, candy coated chocolates), and really, who doesn’t want to wear something that reminds you of chocolate! With the Sirdar, I cast on and completed a second ‘Cousin Cowl‘, a project I initially reversed engineered for my cousin, hence the name. I was inspired by the Leaf Lace Bandana Cowl on Ravelry, and took the general structure of the cowl and made it my own with a completely different lacework pattern. I liked the one I made for my cousin so much, that I made another. A quick knit, I finished it in four days. The colour difference with natural light and direct sunlight is amazing! The bottom picture shows the colour flecks of the tweed! And finally, I needed to keep my hands busy on Saturday, so I made excellent progress on my Hermione Everyday Socks, finishing Sock #1 on Sunday, and casting on the second later that afternoon. Loving the self patterning yarn, and the texture of the knit fabric is just lovely! Seriously, what happened to the girl who was seeking inspiration?! Many thanks to those who commented last week! I now have new patterns in my ‘Favourites’ on Ravelry, and I was shown different features of this beloved site to check out when I need inspiration. This blogging community rocks! Author LTerechPosted on July 27, 2015 July 27, 2015 Categories KnittingTags Cowl, Doctor Who, Fourth Doctor, Fourth Doctor Scarf, knit, Knitting, pillowcase, sock, Sock Knitting, Yarn7 Comments on I Think I Found My Mojo! I must be crazy… absolutely insane… Why else would I decide it would be a good idea to make pillowcases in the style of the Fourth Doctor’s Scarf?! Well, that’s not really being fair. It’s a good idea because I love knitting, I have more than enough of this yarn in my stash, the pillow forms were only $3 each, and they will be my geeky homage in my living room. But still… what have I got myself into! I’ve started with the pillows. As I said, they were only $3 each at the dollar store and at that price, how can I say no? I bought two during my last shopping trip – one square, one rectangular. The square one I have earmarked for another geeky pillowcase, that one in the style of the 3rd year Griffindor Scarf. 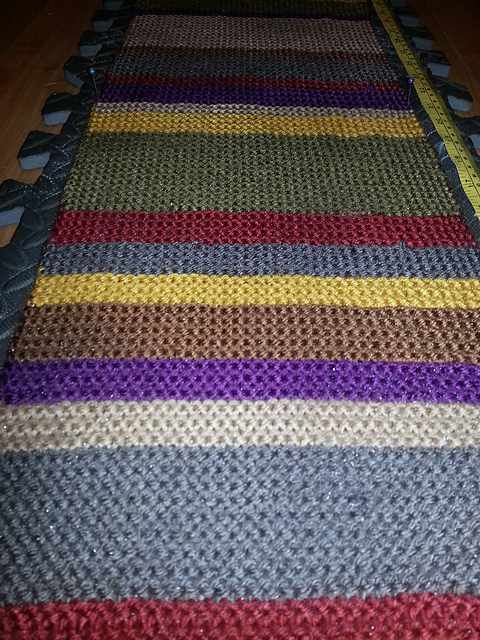 When I saw the rectangle pillow, I knew it would be perfect for Tom Baker’s scarf. My next step was swatching. Like when I made the fingerless gloves, I’m following the basic colour structure and row counts of the scarf from doctorwhoscarf.com, but otherwise I’m winging this project. The pillow’s measurements are 12×20. If I was smart many months ago when I made the fingerless gloves, I would have written down what the stitch gauge was at the time. Good ol’ hindsight. 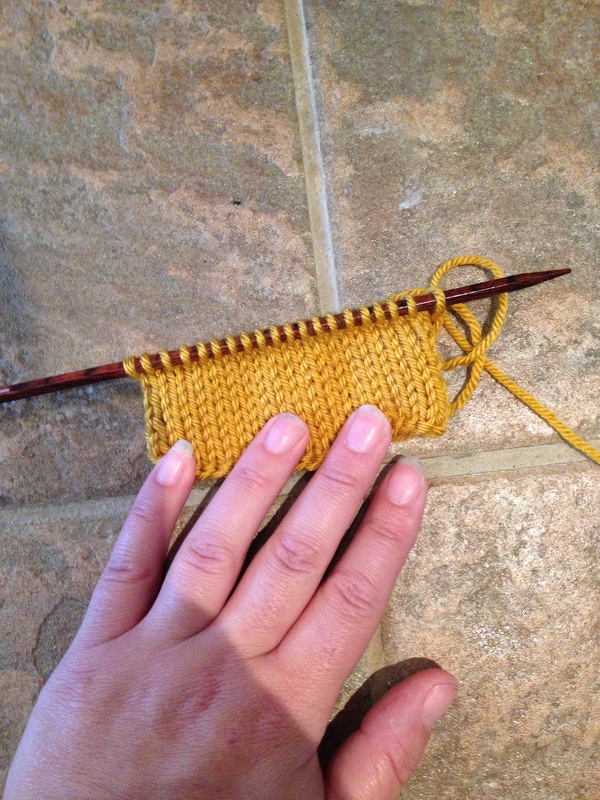 So I made a ‘cheaters’ swatch – I knit only enough stitches and rows to get the rough estimate. I know, I know, I’m so breaking all the rules! Once I figured out how many stitches and rows to an inch, I cast on. I chose to do a provisional cast on because I love the look of the kitchener stitch – once it’s finished, I’ll kitchener stitch it all together. When I made The Scarf, I didn’t knit the full 12-14 foot length. When the pattern called to knit, say 20 rows, I knit half that. I’ve done the same for this pillowcase, it’s still consistent with the pattern, and you can see enough of the colour changes to get the impression of the scarf. As well, while the scarf is knit as garter stitch, I’m knitting this stockinette – only the right side will ever be seen, so it made sense to knit in lovely stockinette. It’s still a work in progress, and with 40 inches to knit, I’m sure this will keep me busy! I’m excited to see it take shape, and the familiar colour palette and colour repetition simply makes me happy. 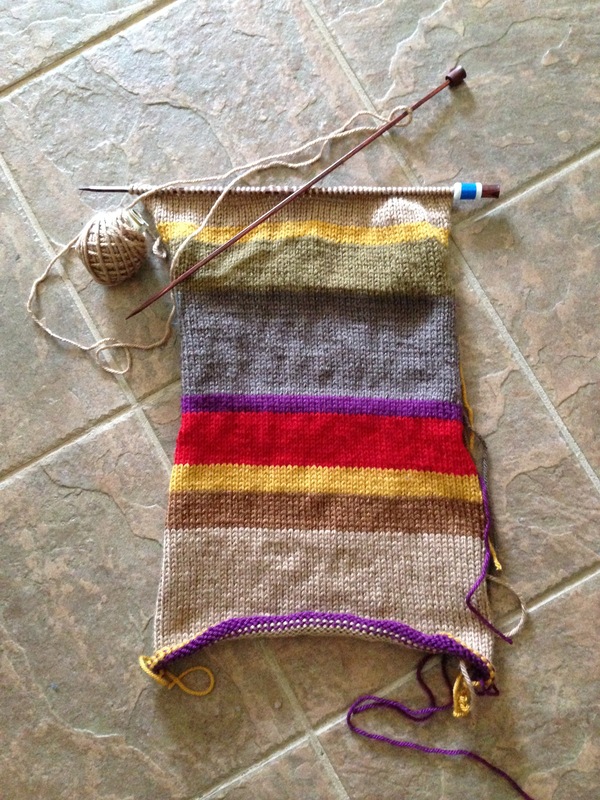 So You’ve Knit the Doctor Who Scarf… Now What? I before I cast on the Fourth Doctor’s Scarf for myself, I spent a lot of time thinking about the yarn. If I was going to make the project, I was going to do it right! The yarn and colour suggestions on doctorwhoscarf.com was very helpful for this, and over a week or so, I bought the seven colours that comprise the scarf. I was lucky that I was able to get the majority from my local yarn shops and from Michaels, but I had to order the green colour online, and the red colour, Paprika from Red Heart, had been discontinued, but an outlet in Toronto had ONE ball left, so I drove 50 kilometres into the City to buy this yarn. This was the only colour where I only bought one ball; the rest of the six colours, I purchased two balls, lest I run short! 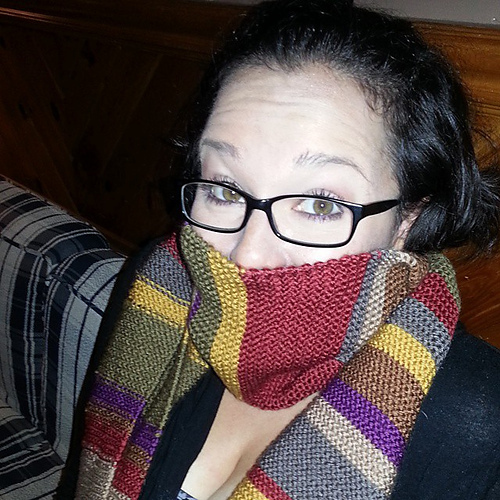 I made my scarf, I love my scarf, but now… well, my stash now has a rather Whovian hue to it! I think I overbought. I was left with the query of what to do with the remainder of the yarn. Wristwarmers to the rescue! 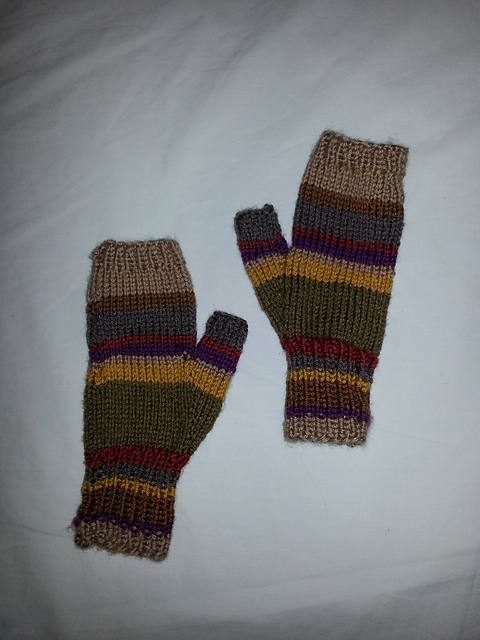 My ‘They’re Warmer on the Inside’ fingerless gloves. They live up to their name! The logical part of my brain shouldn’t love fingerless gloves as much as I do. After all, aren’t gloves supposed to keep your fingers warm, and fingerless gloves kinda defeat that purpose. Despite this, I love fingerless gloves. I have a few pairs of wristwarmers that I’ve made, and I think they are ideal for the Spring and Fall when it’s just starting to get cold, but not so cold that you’re cursing the winter Gods. I don’t know what Elsa was singing about in Frozen, because the cold certainly bothers me! Ultimately, my ‘They’re Warmer on the Inside’ fingerless gloves were a quick project and they keep my wrists rather toasty. It’s also a very subtle Who reference: a fan will recognize the colour pattern and will thus recognize me for the geek that I am, and I’m okay with that. It was a good way to use up a FRACTION of my now stashed scarf yarn, but perhaps my only complaint were all the ends that needed weaving in. There were 14 colour changes, which resulted in, well, a lot of ends. The project was largely improvised by me, but I used Kate Atherley’s Alcazar Mittens as my guide, and I followed a section of the Doctor Who Scarf colour pattern, but quartered it (if it said to knit 12 rows, I only knit 3). Author LTerechPosted on January 12, 2015 December 22, 2014 Categories KnittingTags Doctor Who, Doctor Who Scarf, fingerless gloves, fingerless mittens, Fourth Doctor, Fourth Doctor Scarf, hand warmers, knit, Knitting, pattern, Tom Baker4 Comments on So You’ve Knit the Doctor Who Scarf… Now What? Yes, I am talking about THE scarf! The iconic scarf. The scarf that goes on for miles (or so it seems!). The scarf made famous by the Fourth Doctor, Tom Baker. Perhaps the most notable accessory worn by a Doctor, although I think bow ties, fezzes, and converse shoes give the scarf a run for its money! Tom Baker was the fourth incarnation of the Doctor, on the long-running British series, Doctor Who. First debuted in 1963, the show came up with an ingenious way to adapt to when a lead actor would leave the show, regeneration. The Doctor is a Time Lord from the planet Gallifrey, and Time Lords can regenerate, or change their physical form and in turn their personality, most often as a way to save their lives. Wow, explaining regeneration is complicated! Tom Baker was the fourth actor to portray the Doctor (hense why he is referred to as the Fourth Doctor), he had the longest tenure of Doctor than any other actor, and he is often regarded by fans as the best incarnation of the Doctor. And he wore one of the best pieces of knitware television has ever seen. 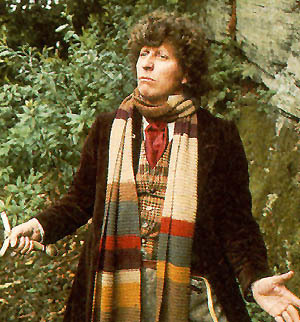 His mismatched , 14 foot long scarf made its debut with Tom Baker in 1974. The story goes, a costume designer provided a local knitter with a bag of assorted yarn and asked her to knit a scarf, but the instructions weren’t more elaborate than that. The knitter then made the scarf using all of the yarn she was provided with. A piece of television history was born. I fell in love with Doctor Who in 2013. Yes, I am a late convert to this show, but once I started watching the 2005 reboot, I watched episode after episode, and I knew my love was solidified by the time I watched The Empty Child and The Doctor Dances. Brilliant episodes. 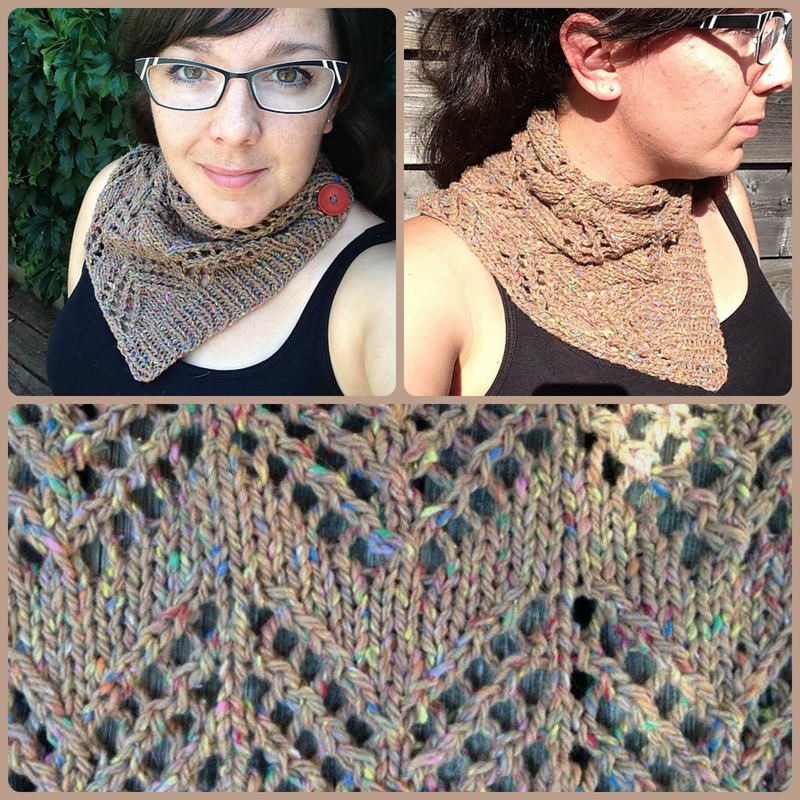 By early 2014, I wanted to make the scarf, and I finally jumped into the project during the summer. Here’s where I admit to a little secret: I CHEATED… The original scarf is 14 feet in length and a foot wide. My scarf: 7 feet long, 8 inches wide. I wanted a scarf that I would actually wear and be comfortable wearing, and I knew my patience would seriously be tried if I went for the 14 footer. Me and my scarf when the latest Doctor Who Series debuted. I finished it in time for the Season 8 debut (the first episode with Peter Capaldi as the Twelfth Doctor), and then I wore it a week or so later at Toronto’s Fan Expo, Toronto’s answer to Comicon. It was a HOT, humid August day, but I proudly wore my scarf. Now that the weather has turned colder, I’m wearing my scarf more often. And I love it. It is warm, geeky, and it reminds me of the time and love I put into it. Many, many thanks to doctorwhoscarf.com for having not only pattern instructions available for many types of yarn weight, but also having a multitude of yarn options for colours suggested as well. The webpage was bookmarked on my phone for months as I searched out the yarn for the project. I followed the acrylic suggestions as best as I could, and ultimately, I am so very happy with my scarf.